A Hemilaminectomy Later, Archie's Home. 10 days is the longest Archie's ever been away from us, and even then he normally had Barney for company. History: I saw Archie on the 25th September 2013 with a 24 hour history of hindlimb incoordination. He was slightly wobbly the previous evening and on the morning of the 25th could barely walk on his back legs. He has a long term (12-18month) history of recurrent, self limiting, mild hindlimb weakness/incoordination where he will drag his paws climbing steps. 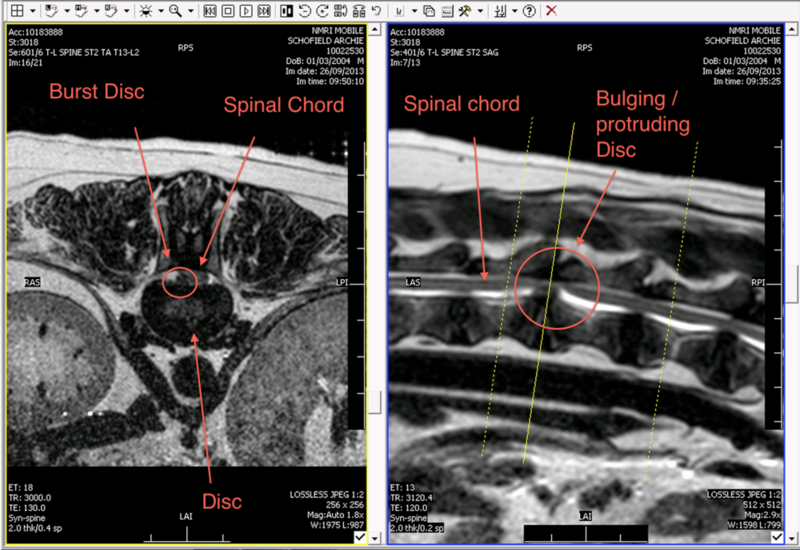 Investigations: MRI confirmed a lateralised disc extrusion between his two caudal thoracic vertebrae. These were likely to be T13/14 as it appeared he had a transitional vertebra. The extruded material was removed via mini-hemilaminectomy on the 26th September as we felt the small risk of deterioration with surgery was outweighed by the reduced chance of future recurrence. He has steadily improved since surgery and is now able to walk unassisted with only mild incoordination. His return to home was delayed as he initially developed some watery diarrhoea and mild abdominal discomfort on the 1st October. He did not have any abnormalities on abdominal ultrasound and this resolved without specific treatment. Subsequently, he started to constantly drip urine and incompletely void his bladder. He reacted to palpation of his urethra and was treated for a suspected bacterial cystitis and urethritis with cephalexin. His urinary signs have now resolved but this morning he vomited once. He is very bright and well otherwise and so we have decided to send him home and investigate this further if his signs persist. Aftercare: He has been discharged on Cephalexin 300mg twice daily for a total of 14 days and 20mg Omeprazole once daily for 5 days (for his vomiting). Please prevent him from jumping up or climbing stairs/playing with other dogs for the next 2 weeks. He should also be kept on the lead when outside for this time. He should recover completely from this injury and his chance of recurrence is between 5-15%. We did not perform prophylactic fenestration of the discs in him as the benefit of this in Bassets is unclear. It can prevent recurrence of disc extrusions but may increase the chance of disc protrusions. As Bassets can experience both diseases we felt the benefit did not out weigh the risk . This could change if he has further recurrences and so if his signs recur we are happy to see him back. 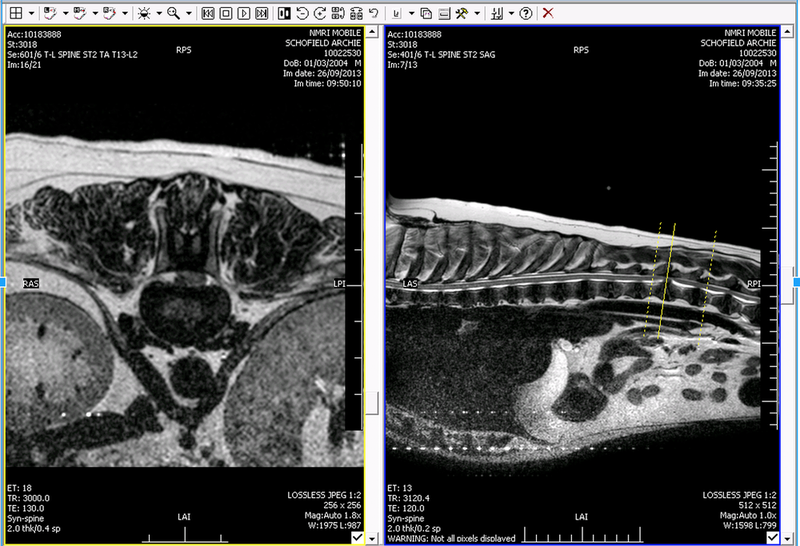 And, if that wasn't enough, they also kindly provided copies of the MRI scans so I could share them for the record. MRI Scan showing Cross Section and Lateral View. Yellow lines reflect cross section position and are located on the affected disc. I can't recommend the Langford Veterinary Services highly enough.